We will arrange a diving expedition to the islands of Socotra archipelago from 15 to 25 October. The purpose of our expedition are islands Darsa, Samha and Abd al-Kuri. On the arabic boat Dhow we go to 9-day trip with overnight stays in the wild beaches of islands Samha and Abd-el-Kuri. We will dive with schools of manta rays near Darsa island. Near Samha island you will see really big fish and interesting coral formations. In Shuab bay on the west of Socotra island we will dive on the wreck, which lies on a sandy bottom at a depth of 25 meters. 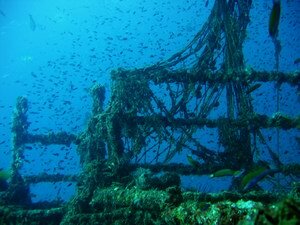 The wreck has become a haven for a huge number of different fish and giant rays. We will be one of the first who will dive around the island Abd-el-Kuri. The group will be accompanied by a local certified dive master. We provide modern camping gear and delicious and quality food cooked by European chefs. Group of 4-5 persons. About 16 dives. The price includes all expenses except air tickets and rental of personal diving equipment. Along with us a professional fishing tour will be conducted by the Italian guide. We accept applications on a similar tour in March 2015.